We are a local Sunshine Coast Business committed to the quality design & installation of Grid Connected Renewable Energy Systems. We design and install to industry BEST PRACTISE. We have all appropriate licenses / insurances, specialised solar tools and a safe system of work. 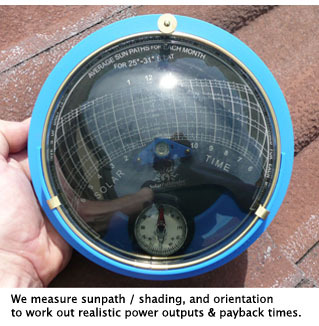 We measure your shading objects (with a Solar Pathfinder – pictured right) and measure roof orientation, so that we can accurately calculate your expected power output based on your actual site conditions. We calculate realistic cost savings / payback times based on your calculated output. We source our equipment from reputable suppliers who are committed and able to service their warranty obligations should a warranty situation ever arise. Our workmanship is of the highest quality, performed by skilled tradesmen. The person who does the quote is the person who does the job. As with most things, you only get what you pay for – so if you want a professional job, done by the book, choose Voltmaster. With some installers you are unlikely to get ? We Offer personalised service – you deal with the designer / installer every step of the way, from initial request to installation, giving an honest appraisal of your site’s conditions (you’ll never deal with unqualified people). We only use the highest quality components to ensure you get longevity and performance from your investment, please refer to our Products Page for more detail on these components including industry leading Component Warranties. – as well as being a local Clean Energy Council accredited Grid Connect Designer / Installer, Scott is also a licensed electrical contractor, ensuring that your entire job is installed in one neat and professional package, with all Workmanship covered by a 5 year Warranty. Being a one stop shop, we have have complete control over the quality of workmanship, array cabling, hardware, sealants, enclosures, switch gear and fittings – it’s these little things that make our installations better and we are confident that our installations will outlast our competitors. Following the site inspection, we will provide you with a comprehensive System Output Report based on your site’s conditions and a quote for the complete system installation. 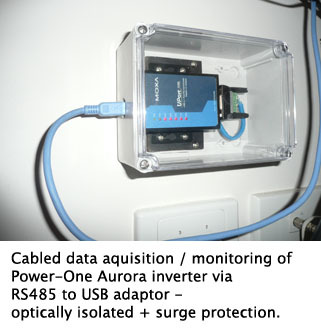 Click on this link to view an Example PV output report. Why is a design like this important ? Unless you are provided with a comprehensive design, you will be unable to see what factors are influencing the output of your PV solar system, or what the actual specifications / design elements are. I am constantly amazed by the lack of proper documentation supplied by other companies who do not follow CEC design / install guidelines, it’s no wonder that they can do the job for half the price, they are only doing half the work. taking into account the actual orientation / tilt and shading of your site – if you receive a quote without this information the company providing the quote is not following the Clean Energy Council’s Guidelines. We will, use only quality materials, design and install every system according to Clean Energy Council Guidelines in accordance with all relevant standards, assist you with all paperwork and supply a Certificate of Test (Electrical Safety) on completion of the job. We won’t, cut corners. We won’t make unrealistic performance claims and most importantly we won’t do a bodgy job. We believe that the use of Renewable Energy technology will help to make a Sustainable future on our planet. Making the decision to embrace these important ideas will help to make this change a reality. You’ll find more info on the Solar FAQ page. Contact Us for free information or to organise a Site Specific Solar Analysis *Note – charges now apply for Solar Site Analysis, starting at $99 incl GST(Sunshine Coast only) which includes 1 Hr labour, however where a complex shading analysis is required, additional labour is charged at $66 / Hr incl GST. (Note – there is typically 45 min off-site labour in order to manipulate the data into your output report which shows expected power for each month of the year and cost savings / payback times compared to your own daytime electricity usage). A complex shading assessment usually costs around $220 incl GST. Unfortunately there are many operators who do not Design (or install) to industry BEST PRACTISE and they do not provide an accurate solar site analysis (or any solar site analysis) to you. We are no longer able to provide this service for free while the shonky operators dodge this CEC requirement altogether, we are therefore forced to charge a fee for our expertise in this area. How accurate is this output report ? Several recent case studies over a one year period produced 106% output compared with the report, the report includes a 5% derating for dirt and since the panels were not very dirty, this means they are producing within one or two percent more power than shown in the output report.